Pick a 3-leg height-adjustable frame's color that complements your style, then select accessories to match! Our 27.5" feet work for the majority of desks, but for desktops less than 28" deep, we recommend the 24" foot option. To get your order even sooner, we recommend selecting our expedited production option. The UPLIFT 3-Leg Height Adjustable Standing Desk Frame is offered with a cast-molded aluminum foot for extra stability. Typically, the legs are centered on the feet of a traditional desk, but our legs are offset to the rear of the feet on the C-frame, allowing 3.5'' of extra mounting space underneath the front of the desk for installation of a longer keyboard tray track or other accessories. The C-frame foot gives you a slightly more stable desk than other frames do because it is built to be very stiff with its cast-molded aluminum construction to allow for its advanced design. Add an UPLIFT 4-Port 3.0 USB Hub for FREE when you buy an UPLIFT Desk Frame! This will allow you to connect up to four extra USB devices to your computer. It also allows for lightning fast data transfer, which will save you the time and hassle of switching out devices because you don't have enough USB ports. Add a pair of UPLIFT Under Desk Accessory Hooks for FREE when you buy an UPLIFT Desk Frame! Use them to hang bags, headphones, keys, or anything else you want to keep handy. Or turn them into a versatile wire management solution! Add an UPLIFT Notebook and Tablet Stand for FREE when you buy an UPLIFT Desk Frame! It features seven height and angle positions for simple screen height adjustment on laptops and tablets, and folds nearly flat to stow away for easy travel. When you're in need of a larger workspace, the UPLIFT 3-Leg Height-Adjustable Standing Desk Frame is here to help you handle even the heaviest desk setups. It's designed to accommodate our largest L-shaped corner desks, supporting up to 530 pounds easily. Smooth transitions from sitting to standing allow for more movement and varied postures at work, giving you health benefits like better circulation and increased focus just by switching up your desk. Two legs on the C-shaped frame and one upright support leg ensure that you've always got the support you need on bottom to support a larger desktop. Each steel leg has its own motor, giving you quick adjustments when you need them. Raise or lower your station with our two button up/down keypad, or upgrade to our advanced digital memory keypad for an even more efficient way to change your stance. Once you have your ideal desktop matched with its corresponding frame, accessorize with a wide selection of ergo-friendly tools to keep you working comfortably. This includes accessories like mounted CPU holders, keyboard trays, and even monitor arms. Height adjustable desk frames are the foundation of an ergonomic workstation, so start from the ground up and build your ideal desk with a 3-Leg frame that works to enhance your work style, bringing you closer to your ideal ergonomic desk setup with a few basic components. I have the advanced keypad with memory presets, and when I touch one of the presets my desk only moves a fraction of an inch. Is there something wrong with my keypad? Your memory presets are probably working just fine! Odds are that you have an older control box. To recall your preset heights, you have to press-and-hold the memory setting until your desk reaches standing height. This is for safety, since the older UPLIFT 3-Leg Frame did not have the ability to sense an obstruction and stop. If you see the number 99.046.14.0070 printed on the sticker located near the power socket, then your control box is capable of one-touch memory preset function and may need to be reset - see our Programming Your UPLIFT Desk PDF for instructions on locking the keypad, changing the memory presets from one-touch to press-and-hold, and setting new lower or upper height limits. If I live outside of the United States will this desk work with my outlet and voltage? All control boxes by UPLIFT Desk are designed to run on the US electricity standard of 120V. If you are ordering a frame from outside the United States (with the exception of Canada), you'll need to plug your desk frame into a step down transformer before you plug it into a power source. If you don't use a transformer you run the risk of overloading your control box, which is not covered by warranty. If you have any questions at all regarding how your country's voltage works with this frame, please contact us. You bet! You can check to see which version of control box you have by glancing at the silver label on it. If it says v4.1, v4.2, or v4.3, you know you have the newest version of UPLIFT Desk's control box, complete with a few new features! The latest version of UPLIFT Desk's control boxes comes with a new safety feature - Anti-Collision. This allows you to set the sensitivity for your desk, so when adjusting your desk stops when it touches an object, instead of continuing to raise or lower. Keypad Lockout is another new function you'll love, in addition to the new ability to toggle between One-Touch and Constant-Touch modes with just a few buttons. You'll also be able to switch between inches and centimeters on your keypad. Read about how to access these awesome new features on our blog post about the subject! How does the Keypad Lockout feature work? In order to add an extra layer of safety to our desks, UPLIFT Desk designed their latest version 4.1 control boxes to be able to be locked so children and unwanted users cannot adjust it when this feature is turned activated. To lock the keypad, press the "M" button for 5 seconds until the LED switches to "LOC", then press and hold the the "M" button to turn on the lockout feature. To unlock it, just press the "M" for 5 more seconds. Does this frame have to be arranged in an "L" shape? It does not! The UPLIFT Desk 3-Leg Frame can work on a large rectangular desk as well. Contact our Sales Pros for custom configurations or to ask if the setup you have in mind will work. Can I retrofit my old frame to be like the new frame, with the additional crossbars? Yes, you will just need to purchase some additional pieces for your current standing desk frame. Contact our Sales Team so they can help you order exactly what you need and walk you through the reinstallation of your desk. Can I install my desk's legs in a different configuration than I see in the installation manual? You may, but we have included the sturdiest leg configurations in the assembly manual. If you place your legs in a different configuration you may experience more wobble. Can I use this on a rectangular top? Yes, the UPLIFT Desk 3-Leg Desk Frame can be used with a rectangular table top. Just push the 3rd leg toward the back center of your desk for additional support. My desk frame doesn't seem to be responding when I try to adjust the height. Is there something wrong? If your desk isn't moving at all, the most likely culprit is that one of the legs isn't connected all the way. For safety, the desk can only function when all three legs are connected. Check your wires and if you are still experiencing issues, please give our support team a call. What do you mean by C-Frame? We refer to our legs as "C-Frame" legs because the shape of the leg and foot form a C. This design makes for a very stable height adjustable desk frame. What's so great about having a motor in each leg? UPLIFT Desks feature a motor in each leg, so you can rest easy knowing that you have the safest, quietest, strongest, and most reliable desk you can buy today. Is this frame a three-stage frame? Yes! All UPLIFT Desks are three-stage thanks to the 3 spindles UPLIFT Desk uses in each of their frame legs versus the standard 2 you find on cheaper electric sit-stand desk frames on the market today. Because of this extra spindle, UPLIFT Desks are 33% quicker to adjust! Also, three-stage frames offer users a higher range of height adjustability, so they fit more people, from petites to the very tall - even kids! If you plan on adding a treadmill to your workstation in the future, a three-stage frame is crucial to give you the extra height you need to raise your desk high enough to use the treadmill. Is the 3-leg frame as quiet as the 2-leg frame? Yes! UPLIFT Height Adjustable Desk Frames fall somewhere along the decibel spectrum between the noise put off by your computer and your refrigerator. That is pretty quiet if you ask us! How many pounds can this hold? The UPLIFT Desk 3-Leg Desk Frame can hold up to 530 lbs, including your desktop. How many people will I need to assemble the 3-leg desk? You should be able to attach the frame to the desktop by yourself. However, lifting your new standing desk and setting it right-side up is definitely a two person job. 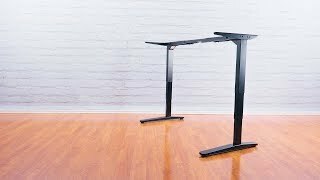 I own one of your 2-leg desks and want to expand it to a 3-leg frame. Is that possible? Yes! Our 2-leg to 3-leg Conversion Kit makes it easy for you to switch the configuration of your desk. With three legs, you can get add extra stability or create an L-shaped desk without having to buy a whole new frame. Can the frame be painted? No, paint would interfere with the mechanism as the height adjustable legs retract. I have an Ikea desk that I love, but wanted to put some upright legs on it. I called Human Solutions and spoke to a rep who was super helpful. He explained my leg combination options based on the desk's dimensions, and guided me through the building process since I was going to be working with my own desk top. The legs arrived less than a week from ordering, and as described, they were heavy, well-built, sleek and slender. Assembly instructions were pretty straightforward, but I had to improvise a little since I was working with my own desktop. The Ikea desk is made of MDF, which made me a little nervous to work with. I drilled pilot holes and used the provided wood screws with a dab of epoxy to secure the legs; it worked like a charm. Turning the desk upright was the biggest obstacle (man, was it heavy! ), but once in place, the legs worked perfectly and were very sturdy. I opted for the memory keypad so that I could just program a few height settings (highly recommended!). The one thing I ran into and will advise for future buyers is to make sure you give enough slack to your device and lamp cords as you're cleaning up and doing cord management. The legs are sensitive to obstructions and will stop moving if it feels any resistance while lowering (a great safety feature! ), so a misplaced cord that juts into the leg at the wrong spot can cause it to stall. Overall, I am in love with these desk legs and would highly recommend it to anyone looking for an upright option. Installation took less than an hour. My new desk is incredibly solid and stable. The base can lift 750 lbs or so. I sat on it and it didn't even strain to lift my 180 lbs. Setting up the programable keypad was super easy works great. Overall, I COULD NOT BE HAPPIER!! Pros: Super solid construction, simple install and setup. So far I love this product. All works great and is sturdy. I am sure my installation was not recommended as I did not have the room in my tight area to flip my L-shaped desk upside down to install the legs. I rather had to assemble the legs and then place them under the desk first. Then utilizing the three legs (unsecured) I lifted the desk and removed all panels that supported the desk. After that it was simple, I lowered the legs all the way down and unplugged everything. Then climbing under the desk I positioned the legs where I wanted and screwed them into place. Reconnected everything and I was off and standing in front of my old business desk. $699.00 List Price: $1,139.00* The list price is the same as the MSRP (Manufacturer's Suggested Retail Price). It may not necessarily be the price at which the product is sold.